Two Masks For Dewy Skin. | By Millie. I think out of all the skincare products on the market, face masks are by far my favourites to buy. They are the perfect skin pick-me-up and complete any relaxing night-time routine. I try to apply a face mask at least once or twice a week, and 99% of the time I will do a good multi-mask which involves applying a couple of masks on the skin at a time, depending on which areas need what. 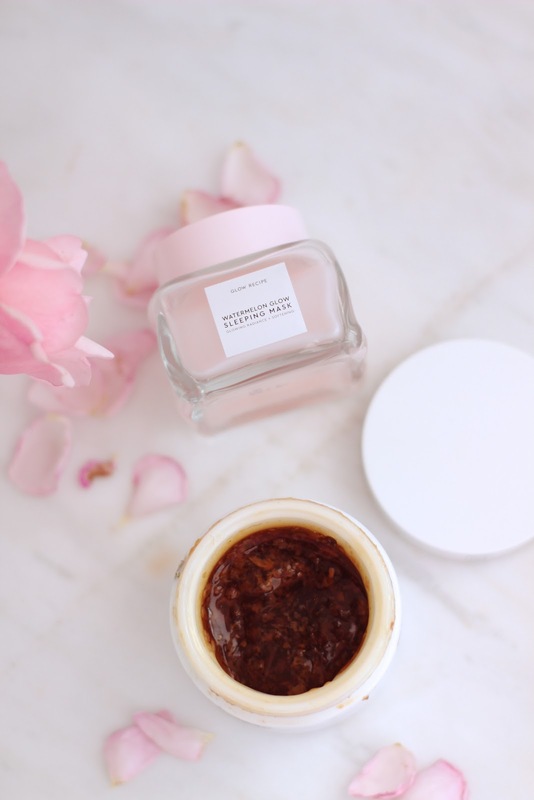 Today, we’ll be focusing on a couple of masks which give the skin a lovely glow and add that extra dose of hydration - my favourite kinds of masks personally. One you can use overnight, and the other is one you can leave for about 15 minutes and rinse away. For a more intense, overnight treatment I’d highly recommend checking out the Watermelon Glow Mask from Glow Recipe. As the name would suggest, this is a lovely smelling mask which really refreshes the skin, as well as nourishes. If you don’t have a lot of time in the evenings to apply and mask this is a great time hack as you can apply it before bed, then rinse away any excess in the morning. The formula of this is very gel-like, it feels very light-weight on the skin and sinks in beautifully. When I wake up my skin feels so soft and it looks very radiant. I think this would be great if you have dehydrated/dry skin. If you’re after something which feels a bit more luxurious, and something to add to your pamper routine, the Fresh Rose Hydrating Mask is fab. This is one of my favourite ever masks. It smells great, feels amazing on the skin, and most importantly it leaves my skin feeling and looking amazing. The rose hydrates the skin and the formula feels nourishing and really helps to perk up my lack-litre complexion. This does dry down into the skin, then once you rinse away you'll be left looking very healthy and glowy. Fresh masks overall are great, they are pricey, but you get 100ml of product so they do last a while. I've also got my mum hooked on this, she loves it!